Sticks N Sushi is a stylish sushi and yakitori restaurant that recently made the leap from its native Denmark to London. The Wimbledon branch opened its doors in 2012, soon followed by the Covent Garden location in November last year. Founded 20 years ago, the chain took inspiration from the Rahbek brothers’ half-Japanese, half-Danish background – their restaurants feature stylish and modern interiors (each one quite distinct from the others), welcoming staff and beautifully presented Japanese food. 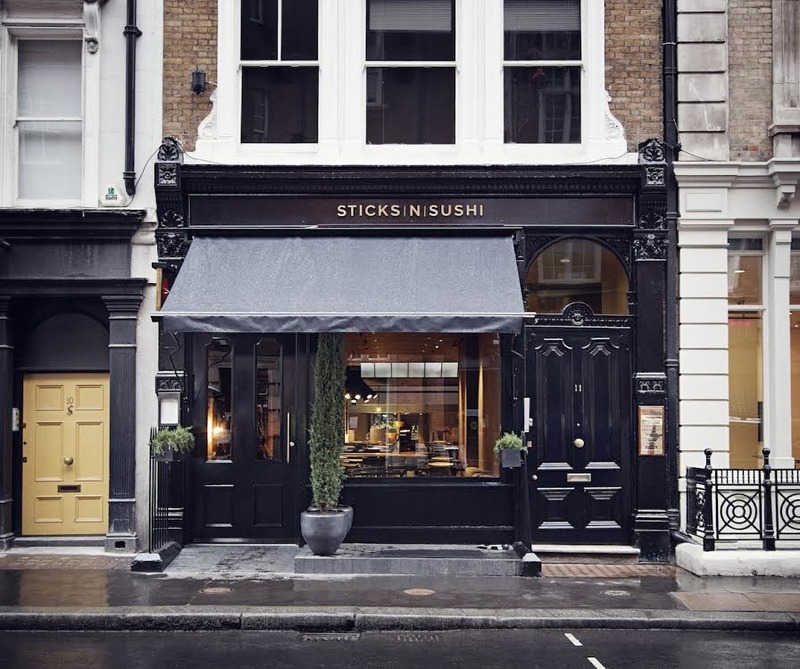 Given the existing popularity and prevalence of sushi restaurants in London, we may, perhaps, be a harder market to crack than Denmark but the combination of sushi and yakitori in one place is, as far as I am aware, unique and the attractive and spacious venue in the heart of Covent Garden will surely appeal to locals and tourists alike. Because Japanese cuisine was not that well known in Denmark, Sticks N Sushi menus were designed to be extremely visual, so that customers could see exactly what they were ordering; this remains the case today. 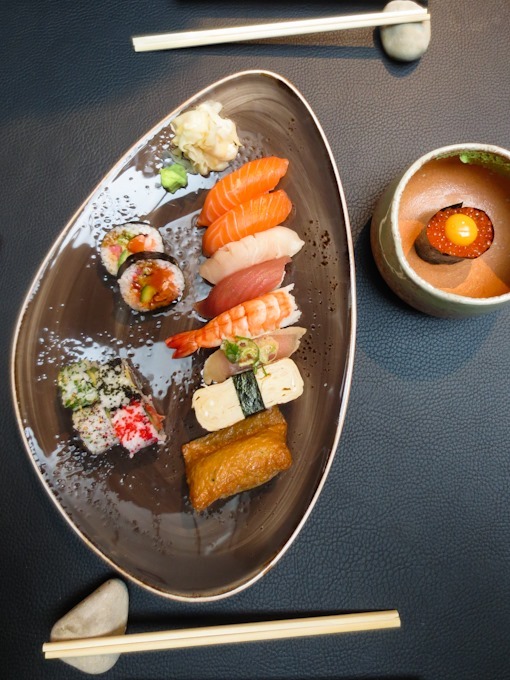 There are two menus – one showcases a long list of set plates featuring different combinations of sushi, yakitori or both. 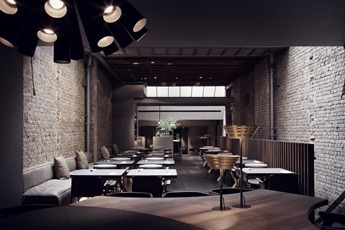 The other allows customers to pick and choose à la carte. 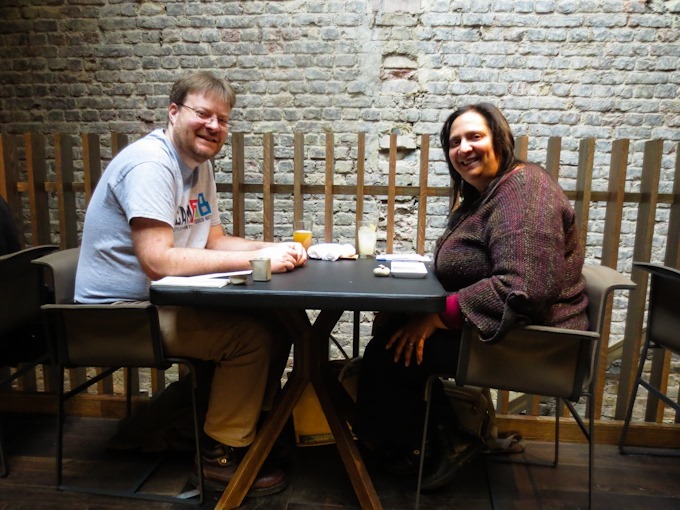 I find the menus rather beautiful and a pleasure to browse through, though the sheer number of choices means it takes longer than usual for me to compare the options and decide what to order. 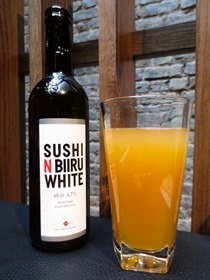 The drinks menu also offers a lot of choice – as well as the usual range of soft drinks, there are beers, sakes, shochus, whiskies, ciders and a variety of wines. The cocktails are particularly appealing, being as they are mostly unfamiliar and rather inventive. Japanese spirits such as sake, shochu, umeshu and whisky feature regularly and I’m happy to see ingredients such as yuzu, jasmine tea, honey and ginger. I like how simple icons in the menu make clear which cocktails come in tall, short and martini glasses. 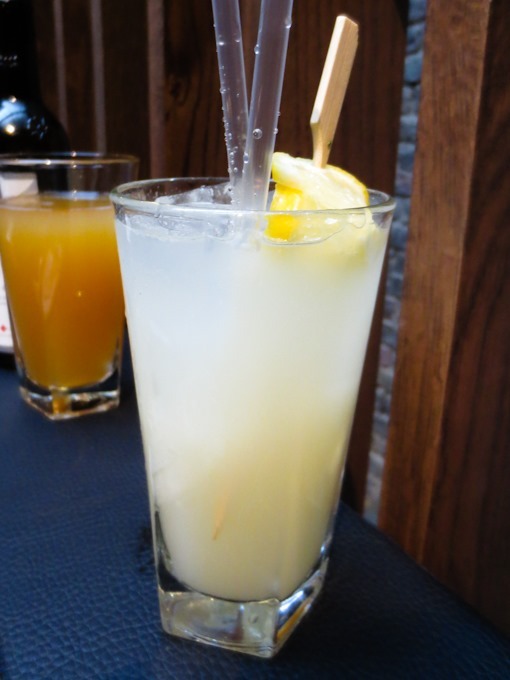 My (alcoholic) Yuzu Lemonade (£7.50) is refreshing but I like my Hanoko (£8.50) even more – jasmine tea-infused shochu with elderflower, honey and fresh lime is an inspired combination. There are beers from Asahi, Kirin and Sapporo in Japan, plus Meantime here in London. 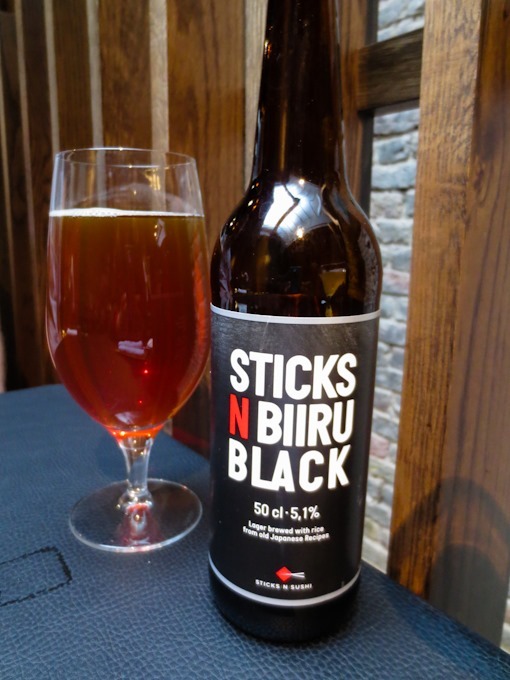 But Pete tries the Sushi N Biiru White Beer (£6.40) and the Sticks N Biiru Black Beer (£6.80) made by Nørrebro Bryghus, a Danish microbrewery in Copenhagen. The two beers are mango-juice orange and a more restrained copper respectively. Chatting to our waitress, we express surprise at the colour of the black beer in particular, only to have her suggest that there isn’t such a thing as a properly dark beer. When we look slightly nonplussed and remind her of Guinness (and all the other popular stouts and porters available) she replies that “those are all made with coffee aren’t they?” I’d say a little staff training on the beer list wouldn’t go amiss! Pete remarks that the White Beer, described as a wheat beer with yuzu, looks like a glass of Um Bongo. On the nose, it’s a fairly standard wheat beer, a little sweet and grassy but no citrus. In the mouth, it has quite a generous body. 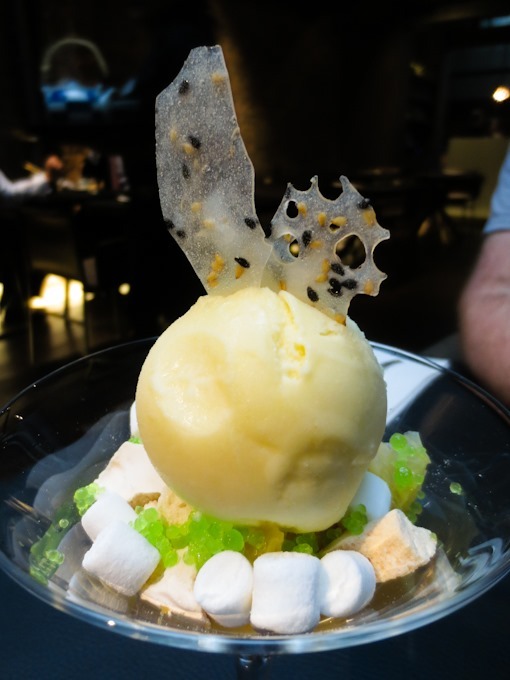 It’s on the sweet side with a touch of honey and a little sourness underneath, but still no yuzu that he can detect. 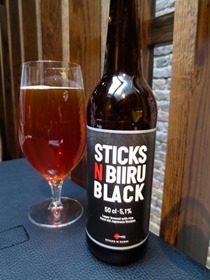 Putting aside its colour, the Black Beer has a caramel malt and slightly earthy hops aroma. In the mouth there is toffee and a decent underlying bitterness that’s deep and pleasing. Hot flannels are provided shortly after we are seated and, as is common in Japan, we’re encouraged to keep them throughout the meal. It’s a nice touch when finger food is involved. We are asked a few times if we’d like to order some nibbles to start, with beef tataki being one of the suggestions, so we’re surprised when the mains come out first; our intended starters arrive some time later. Our waitress explains that she placed the order to “come when ready”; I suggest you make a specific request to have starters first if you’d prefer. Beef Tataki £9.50) doesn’t quite resemble the neat beef rectangles of its menu photograph but the beef is decent enough. The spicy gome (sesame) dressing is super but neither of us like the smoked cheese and chives and we can’t detect the promised yuzu koshu, a spicy condiment made of citrus and chilli. We are divided on the salted almonds, but they’re completely impractical to eat in any case, whether you use chopsticks, fork or fingers, and most are therefore left behind on the plate. 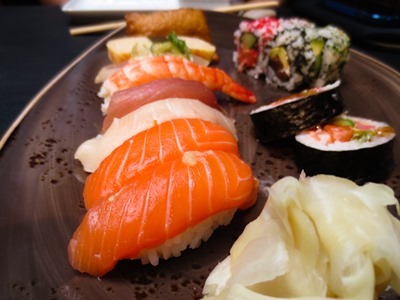 Adam (£18.50), from the set menu, includes 1 salmon nigiri, 1 tuna nigiri, 1 yellowtail nigiri, 1 salmon New York (with garlic) nigiri , 1 tuna tataki nigiri, 1 shrimp nigiri, 1 tamago nigiri, 1 inari sushi, 1 black Alaska uramaki (inside out roll), 1 sparkling tuna uramaki, 1 mamma mia uramaki, 1 dreamy California uramaki and 2 gypsy futomaki (big rolls). The quality of the fish is very good with a nice fresh taste and texture. 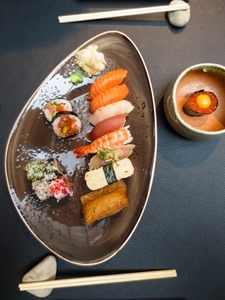 All of the rolls are very tasty but we particularly love the gypsy futomaki which (so the à la carte menu reveals) contains seared fish, spicy sauce, avocado, cucumber, chilli, red onion, ginger and unagi sauce. The disappointing let down of the plate is the sushi rice which both of us find strangely dry and firm, like it’s been left out for far too long after cooking and mixing. I also find it a touch over-vinegared. On ordering, I ask the waitress if there are any other items from the sushi à la carte which aren’t part of Adam and which I absolutely mustn’t miss. 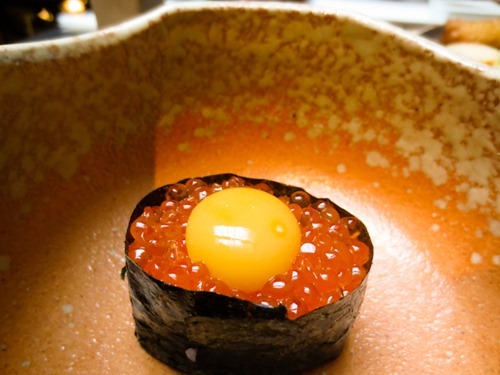 She suggests the gunkan trout roe (£3.20 a piece) and I ask for one, with the quail egg yolk on top. Sadly the ikura (salmon and trout roe) doesn’t have the intensity of flavour that I’m used to – good ikura bursts in the mouth with a sharp, salty fishiness that is completely missing here. From the Sticks sets we choose Man Food (£19.50) which consists of 1 skewer of goat cheese in dried ham, 1 skewer of pork and basil, 1 skewer of beef with herb butter, 1 skewer of chicken breast with sasami chilli, 1 skewer of chicken tsukune, a bowl of plain rice, a pot of kimchee and a portion of edamame beans with salt and soy. 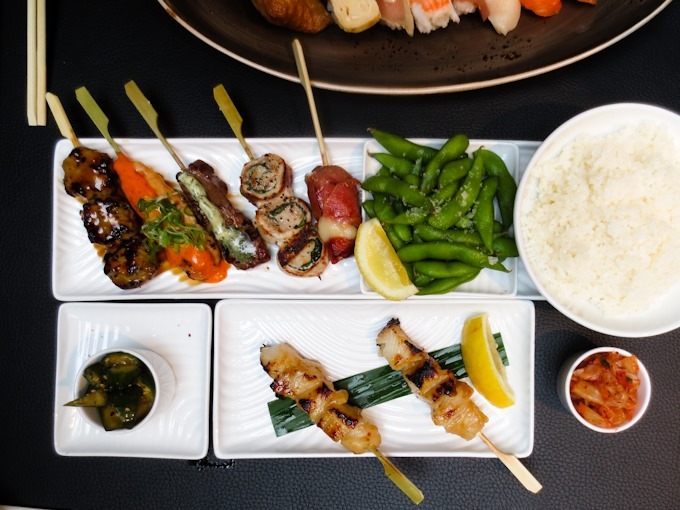 Asking the waitress if there are any other sticks she feels we simply must not miss results in an addition of 2 skewers of Miso Marinated Black Cod (£14.50 for 2 skewers). 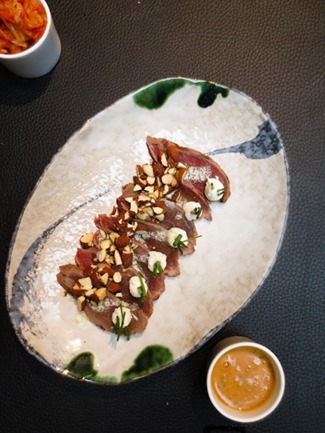 The little pot of Japanese Pickles – cucumbers marinated in ponzu (£2), that we ordered with the beef tataki as a starter, is served with the sticks. Man Food is a deeply delicious set of sticks; but if you’re looking for more traditional Japanese flavours, it’s probably not the set for you. I’d find it hard to resist ordering this set again on my next visit though! 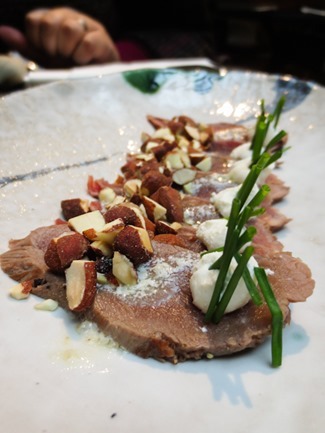 The goat cheese in dried ham and skewer of pork and basil remind me of Italian (and I love them both). The soft and tender beef with garlicky herb butter is straight from France. The sasami chilli chicken and tsukune (chicken meatballs), both of which are moist and pack a flavour punch, are more traditionally Japanese. Excellent cooking! Edamame is edamame, much as you’d expect. However there is so much salt sprinkled over them that I have to wipe some off before sucking them out of their pods. The kimchee and pickled cucumbers are both decent, though the portions are small for the price. The black cod is undeniably tasty due to the excellent marinade, but the flesh is too pappy-soft, and I don’t think they are good value at over £7 a single skewer. 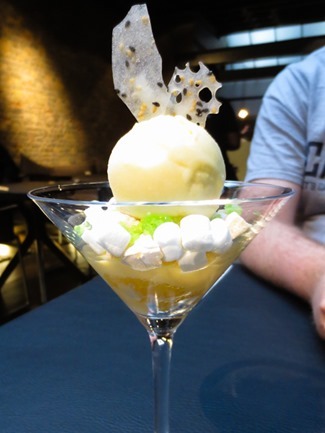 Lemon, Yuzu and Meringue (£6) is a martini glass of yuzu sorbet, segments of orange, pieces of lemon meringue, lemon curd, small lemon and lime pearls and mini marshmallows. Oh, and a crispy shard of sugar with black and white sesame seeds. The marshmallows are a little stale and the tiny green pearls don’t contribute anything more than a funky appearance but oh my this dish tastes good – a satisfying citrus showcase! 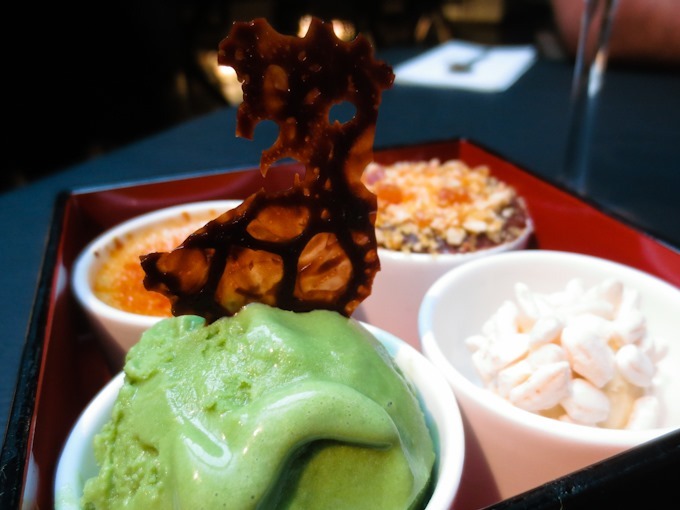 Four Tasters (£8) is just what its name implies – a small taste of four Sticks N Sushi desserts. Vanilla crème brûlée is excellent – a soft and loosely set custard full of vanilla with a crunchy sugar topping. Matcha green tea ice cream has a rich deep flavour and I’m happy it’s not too sweet, but the texture isn’t as silky smooth as I’d like. 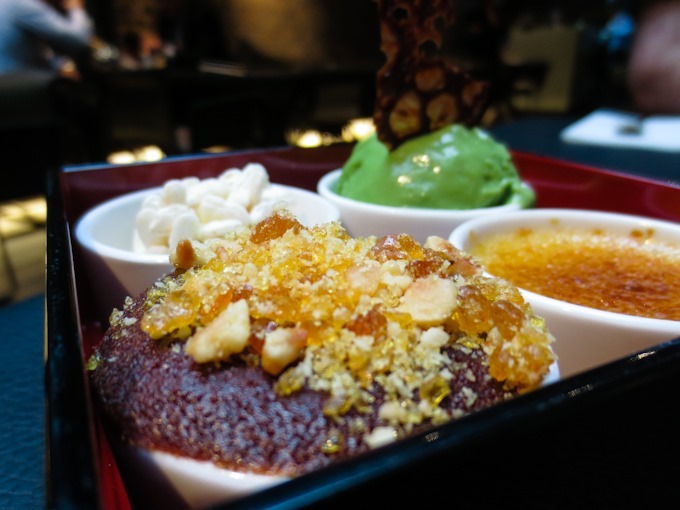 Chocolate fondant with caramel and hazelnut brittle is fabulous with a properly gooey centre of chocolate and caramel and a super nut and sugar crumble. Only the white chocolate with sweet miso and popped rice is a disappointment; the popped rice is soggy like a stale rice cake and there is no discernable flavour of miso in the white chocolate shell or milk chocolate centre. Some of the menu items seem a little too pricey, even taking quality ingredients into account. Sets are better value, though still a touch dear. 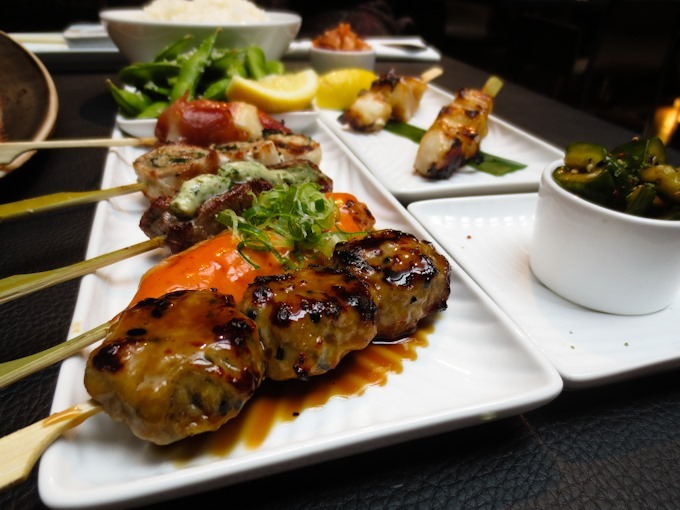 But the food is, on the whole, very good and I do enjoy the combination of yakitori and sushi on the menu. The balance between traditional Japanese and European innovation is also very appealing. It’s unfair to comment much on service, since we’re here on a pre-organised review visit, but certainly all the staff are friendly and enthusiastic. One of them assumes my picture-taking of our meal means that we must be on holiday and sweetly insists on taking our picture. 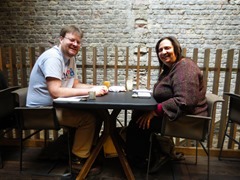 I start to say no and think, what the hell, it’s been a good week and a lovely lunch, why not record our happiness? Kavey Eats dined as a guest of Sticks N Sushi.